I discovered the old battered Graupner Terry in my father's attic during a clean-up. I brought it to my workshop and immediately felt that I had to restore it to flight conditions. Soon that proved to be anything but an easy task. 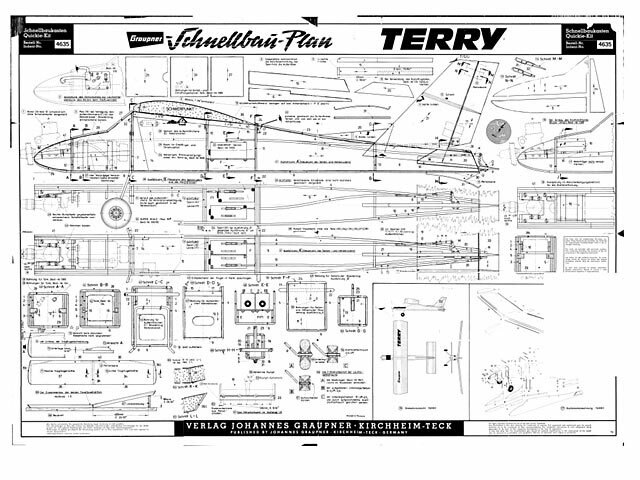 Terry remained upon the shelf for a while, until I found the plans on Outerzone and began feeling good about having a reference for rebuilding formers and empennages, locating the CG etc. Wings were easier to renovate: solid, thick and apparently indestructible. Luckily (very luckily) I found an Ebay shop where I could get replica Graupner stickers - at a price. So I placed the order and proceeded with wings and fuse sanding without regret. In her prime, Terry flew pulled by an ill-tempered, unreliable and powerful OS10, but having forgotten everything about IC engines handling I choose an AXI outrunner as a replacement and hoped for the best. Today is the day, overcast but with good lift and a steady southeast blowing from the sea. Well, as there are no flatfields available in the area, and because I'm hooked on slope soaring since I've gotten back to the hobby (after a 25 years break), I'm flying Terry from the slope! Terry looks good but feels heavy, looks heavy: the lead I had to put in for balancing (E motors are lighter - and shorter! ), the big Lipo, make her heavy. I take the ritual maiden pictures. Strictly speaking she's no maiden, but nobody will mind. Control checks, ok. 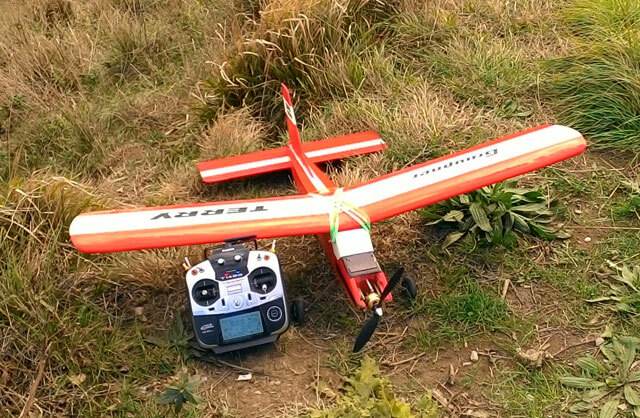 This is a shiny 2.4 Ghz Futaba, not the yellowish 72 MHz AM Skyleader of those times. But she's heavy. Will the AXI deliver enough power to lift her? Will she plunge down the steep slope? At least I'll have height to recover and make an emergency landing. What a shame it would be, after all these years. I'm ready, my wife is watching the scene (no picture of the first throw, please, that brings bad luck), but I'm hesitant. Oops. A gust of wind tears the plane off my hand. It capsizes and falls at my feet - how weird, it's so heavy! Ok, no damage ... damn, the prop's broken! I get furious. I hurl my hat to the ground and want to dance on it. My wife tries to reason on the matter: Why don't you just replace the prop? You have spare props, haven't you? NO! Why should I bring propellers in my (massive) fieldbox, I fly sailplanes?! Now the choice is, either I give up and put the plane back on the shelf indefinitely, or I put everything inside the car, drive home, grab a new propeller and rush back to the flying site. We cram everything inside the car and drive home. In the workshop I find no suitable propellers and after a frantic search and some swearing I decide that a 'used but good' 8X4 salvaged from a wrecked quadcopter will fit. The hub hole is too large, but even with the off-center prop the plane will suffer less vibrations than with the methanol engine. Well, maybe. 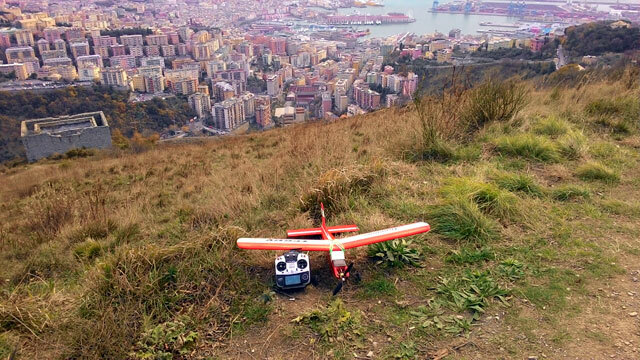 Here we are again, wind blowing from the sea, the city below, the red plane (now firmly) in one hand, transmitter in the other, the uneasy feeling that I'm gambling emotions, memories and something that goes beyond a (too heavy) clump of old balsawood and hardwood, plastic and electronics. My wife is watching, waiting for action to overcome the too many impasses of this day. Anyway we'll finish with this inhospitable, cold ridge and go home. Enough. I push up the throttle stick with my lips (I have only two hands!) and toss Terry overboard, so to speak. And up she goes, smooth and straight as on rails, designed and built to fly. I've kept Terry chained to earth for years, because of my worries and my distinctive lack of confidence. She's responsive and stable, balanced and fit. It's German tech, after all. And now I just can't restrain funny feelings from flowing. Then, I was a young boy in a country field, eager to fly this plane, watching my father busily tending the engine. Now I'm the age my dad was at that time. Years, things and people have passed like in a dream. How went the line of a song from those years? "I was just a child then, now I'm only a man". I catch sight of my wife. She's still upset from my recent outburst. Then, she was a young girl. Years before we'd meet. Now she's hoping for the best, maybe realizing how important this flight is to me. She thinks I'm a good pilot, and knows a happy ending can be ahead if I don't allow a bad attitude to screw everything. I won't, honey. Let's try to ... I cut the throttle and put the nose into the wind. She doesn't just glide, she goes up. I'm able to slope Terry a little. And I thought she was too heavy even to fly under power. A loop and it is time to break the spell and land. I conform strictly to the slope sailplane approach path - because it's the only one I know. 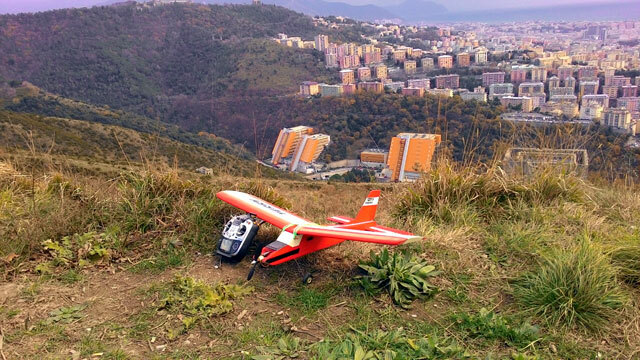 Reduce height, glide up the slope, turn left, last leg parallel to the slope, slow down, cut throttle, that's it. Terry flares correctly, touches down among the wild fennel stalks and does what every honest taildragger is supposed to do: capsizes. I hurry to straighten the plane to prevent the fuel to spill out of the tank. Calm down old boy, it's 2018 not 1983, and there's no greasy fuel around anymore. Ok, let's call it a day. Terry is intact and feels light now. I put everything away and in a few minutes we're ready to leave the scene and head for a much-delayed lunch. Half an hour later we're sitting at the table of a cozy bar. The wind has dragged the clouds away and it's charmingly sunny now. My wife is smiling. Happy with the test flight? Sure. Don't you think you are a lucky guy? Uhmmm ... yes, I was lucky to break only the prop. Did it bring back a few memories from the past? Well ... no, not particularly. Is the old plane fun to fly? Not only fun. It is one of my best planes, one of my best ex-boy?s toys. It's Terry-fic! What I've brought back from the flight site today is not an armful of splinters (as in standard weekends) but the realisation that those old planes can insidiously turn into time machines, make the film reel spin backwards and bring you to a different time and space, make you stumble into your youngster avatar - and then send you back to the future. And you should never overestimate their weight.